We are pleased to announce our relocation to Rainwater Farms just north of the City of Fresno, California. 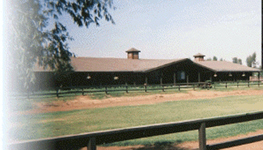 Michael Craghead Stables continues to offer the same high quality services for which we have been known for the past twenty two years on the west coast. Fresno is located in the heart of California's Central Valley, convenient to Both Los Angeles and San Francisco, and is served by the Fresno-Yosemite International Airport with non-stop and connecting service anywhere. Please note that we do not rent horses or conduct trail rides. Michael serves on the USEF Saddle Seat Equitation rules committee and has judged at many of the nations most prestigious horse shows, including the Saddlebred World's Championship Horse Show, Lexington Junior League, The American Royal and both The Morgan Grand National and World Championship Horse Show and the International Friesian Horse Grand National Championship. Come visit our store for T Shirts, Caps, Mugs and More!